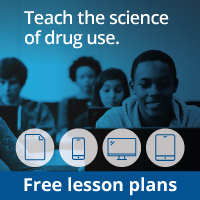 Demonstrate how scientists located the structures important for the addictive nature of drugs. Show that a rat will self-administer cocaine directly into the nucleus accumbens (or the VTA) to activate the pathway. Point to an area close to the nucleus accumbens or VTA and state that if the injection is placed in this other area, the rat will not press the lever to receive the drug. Indicate that scientists know a lot more than where the drug acts to produce rewarding effects - they also know how the drugs work. Show examples with cocaine, heroin, and marijuana. NIDA. "The Brain & the Actions of Cocaine, Opioids and Marijuana." National Institute on Drug Abuse, 1 Jan. 2007, https://www.drugabuse.gov/brain-actions-cocaine-opioids-marijuana. NIDA. The Brain & the Actions of Cocaine, Opioids and Marijuana. National Institute on Drug Abuse website. https://www.drugabuse.gov/brain-actions-cocaine-opioids-marijuana. January 1, 2007.